Himalaya Herbals Protecting Neem & Turmeric Soap is fortified with Neem and Turmeric which, through antibacterial action protect and keep skin refreshed and healthy. The soap base is made from vegetable origin. 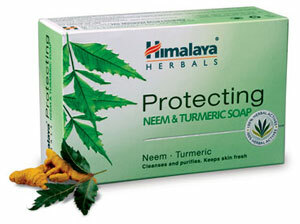 Wet the body, apply Himalaya Herbals Protecting Neem & Turmeric Soap generously, work up a lather and rinse.